To get the most out of the cool summer evenings in the Vail Valley, consider the luxurious comfort and stylish design of patio sets from Inside Out Home Furnishings and Design. We offer a wide variety of patio dining furniture, patio furniture sets and lawn furniture that will encourage your family, neighbors and house guests to get outside and socialize. Whether you want to host a dinner party on your lanai using your patio dining furniture, or arrange your lawn furniture for an impromptu gathering of friends from the neighborhood, the patio sets at Inside Out Home Furnishings and Design will let your guests know that you care about their comfort. Do you plan to entertain this summer, but don’t want to settle for making a humdrum impression? Come into our ever-evolving showroom in the heart of Edwards and let our selection of patio furniture sets spark your imagination. 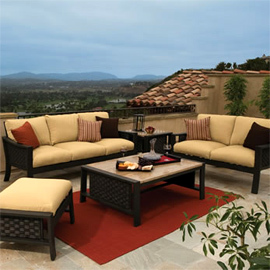 Contact Inside Out Home Furnishings and Design today to learn more about our new and interesting patio sets. We have all you need for patio dining furniture, patio furniture sets and lawn furniture in Vail, Aspen, Beaver Creek, Glenwood Springs, Edwards or wherever you call home in the Vail Valley.